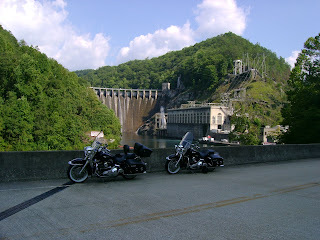 Cheoah Dam, aka, "Fugitive Dam". This is the dam that Harrison Ford was shown as jumping off of in the movie "The Fugitive", known by locals as Fugitive Dam. The huge pipe on the right is the pipe Tommy Lee Jones and his band of merry men walked down in search of "The Fugitive" (you can look this up, too).